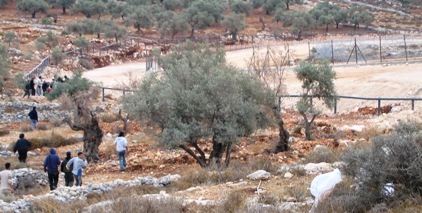 This fence cuts through the olive-groves of Bil'in. 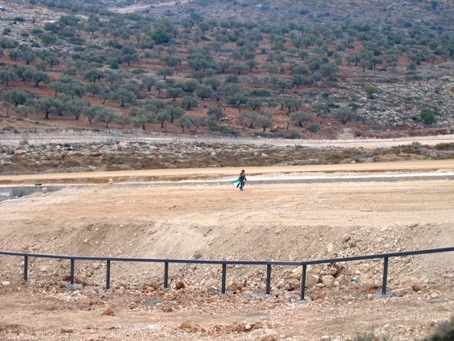 Claimed to be a "security-fence", its real aim is to confiscate some two-thirds of Bil'in's land for the benefit of Israeli real-estate sharks. Don't let its "innocent" look mislead you. Built at the average cost of 3 Million US$ per Mile [10 Million IS per km], it hides enough state-of-the-art electronics to deal with the lacking life-saving equipment in all Israeli hospitals. Al Jazeera photographer[?] 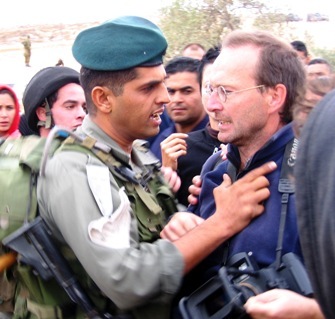 being brutally attacked by an Israeli border-police officer. The officer was in a state of total loss of control. This picture did not capture his most violent moment. 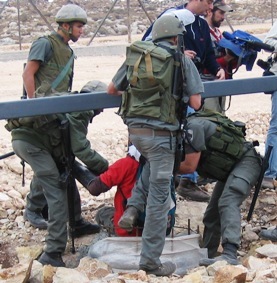 Al Jazeera: Police arrest, beat our cameraman during West Bank protest [Haaretz, in English]. 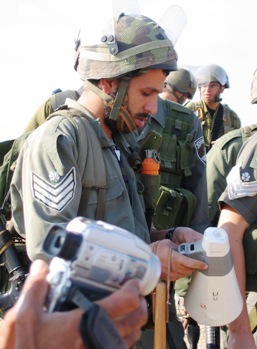 NRG (Maariv): "Soldiers have beaten an Al Jazeera photographer". 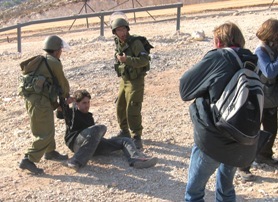 BBC News: "Cameraman freed by Israeli police"
The Guardian: "Al-Jazeera Cameraman Detained in Israel"
New York Times: "WEST BANK: AL JAZEERA CAMERAMAN HELD"
San Francisco Chronicle: "Al-Jazeera Cameraman Detained in Israel"
Even using my pictures, Yair Gil's rendering beats mine. 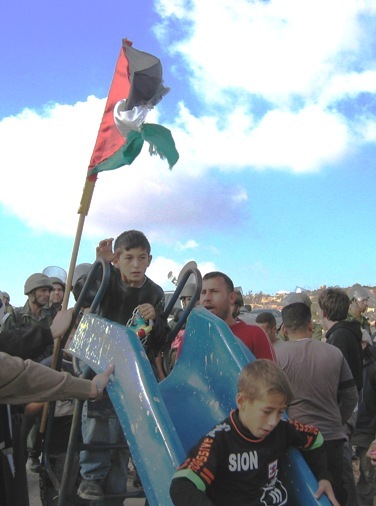 The Gush-Shalom report, by Adam Keller, with an appeal for the release of 14 years old Abdullah Yassin and 17 other minors. Left: The soldier on the right-hand-side looks angrily at the photographer who documents the soldier on the left beating a demonstrator. Below: The officer-in-charge is being reprimended by the representative of the Army Spokesperson. 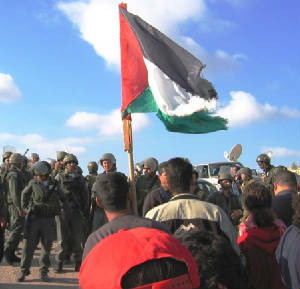 We arrived on Thursday evening, to avoid a possible army blockade that has recently been imposed every Friday morning on the area encircling Bil'in, to reduce the number of Israelis reaching the weekly demonstration. Our arrival experience has reminded me of scene I in Act III in Carmen, by Bizet. 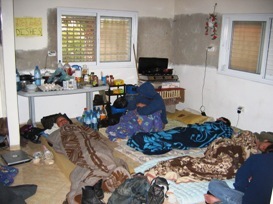 Slumber party at the ISM Hotel, Bil'in. 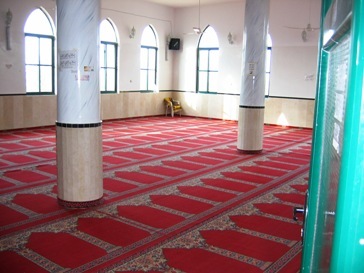 I woke up at 04:30, to the sound of the Muezin's call, from the mosque next door. Used two peaceful hours to write the concluding section of a paper on "non-universality of the commonly used correlation-energy density-functionals". 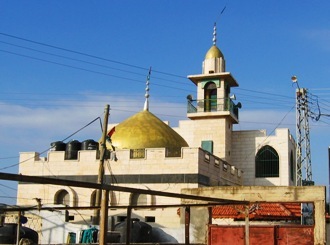 Legal situation: Bil'in is in area B, where the "General's Order" [prohibiting Israelis from entering Area A; an order the courts refuse to accept as a basis for indictment!] does not apply. That does not mean that showing up at the checkpoint and asking to go through would allow you into Bil'in. 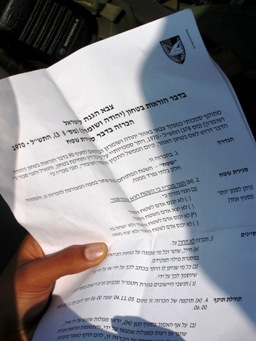 Permit to demonstrate: I don't know of a permit ever issued for a demonstration within the Occupied Territories. I wouldn't recommend bothering to apply for one. 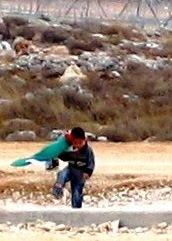 If you are confused by this lawlessness, be happy you are not a Palestinian. Below: The inevitable "closed military area" order. 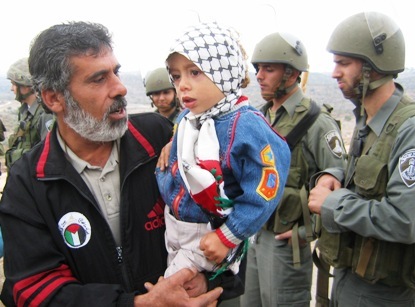 Once issued, the presence of Israelis and "Internationals" is illegal. 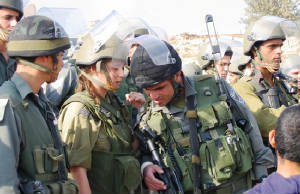 Our position: It is the army (and border police) who are illegally present on this Palestinian occupied land. New type of missile? 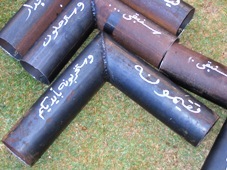 Two-pronged kassam? 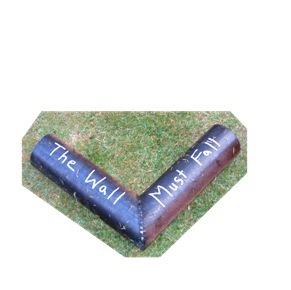 It must be a very dangerous anti-wall device! 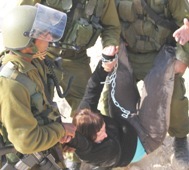 Scoop: These are hi-tec self-controlled handcuffs, Made in Palestine. Internal mechanism still classified. 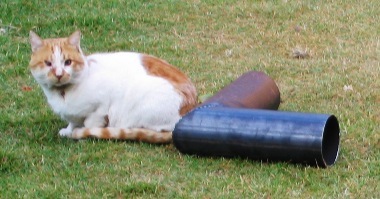 Above, left: tied to the fence. Above, right: can't be unlocked! Below, left: Once released, on the way to being detained. Above: ready to welcome us with first stage equipment: megaphone, baton, stun granade (coulored orange, so as not to be applied to "orange" demonstrators). 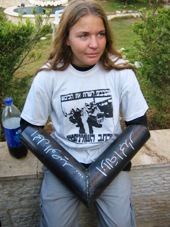 Rubber bullets, foam bullets, tear-gas canisters, live ammunition, are all available. Below: Freud would have loved this picture. Left: Portable playground established on the demonstration line. 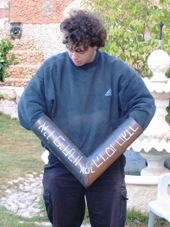 The soldiers keep protecting the fence against this non-conventional weapon. 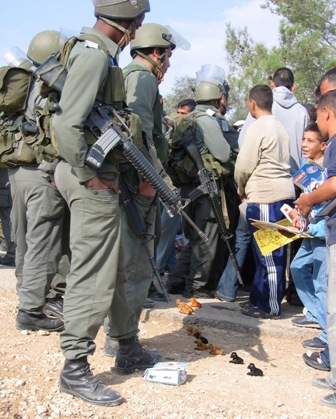 Below: Toy dogs placed by Palestinian toddler, to chase the soldiers away. Below, Left: Toddler daring the fence, on the forbidden "security" lane. 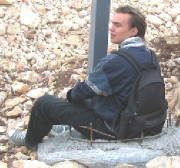 I paid for my own transportation to Bil'in. My tax-money paid for the gasoline and maintenance of these vehicles as well. I doubt that you have a hard time identifying who is the just, and who are the oppressors. The good news is that the just will win. In fact, the oppressors will win too: Peace with a friendly and cooperative neighbor, who is still willing to pardon them. Their biggest gain will be a chance to start being decent people. A final observation: On this occasion, for the first time, I noticed an attempt by the officers to distance themselves from the orders they were following, by keeping to refer us to the "generals" and to the government.